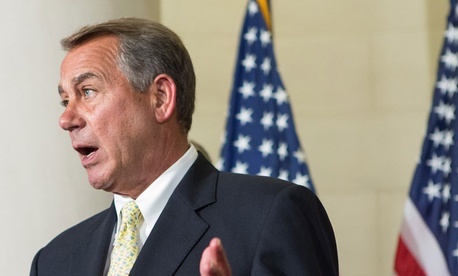 Will Boehner's Lawsuit Compromise the House General Counsel? It's not so easy, it turns out, for Congress to sue the president. Speaker John Boehner is finding that out the hard way after a second law firm withdrew from representing the House in the Republican-led lawsuit against President Obama over his use—or overuse—of executive authority. William Burck of the Washington-based firm Quinn Emanuel pulled out of the case last month, not long after he signed a contract with the House to replace David Rifkin of BakerHostetler. The yet-to-be-filed suit has become an embarrassment for the speaker after he led the House in a party-line vote to authorize legal action against Obama back in August. The lawsuit would accuse the president of exceeding his authority by delaying implementation of the Affordable Care Act's employer mandate without permission from Congress. In both cases, according to sources working on the issue, the law firms succumbed to political pressure from Democratic clients who threatened to pull their business if the firms represented the House GOP in a partisan suit. Congressional Democrats had decried Boehner's move as a waste of taxpayer money. They also successfully parlayed the planned lawsuit into a fundraising boon by telling liberal supporters it was a prelude to impeachment, which Boehner insisted was not the case. But not only did the two firms withdraw, they ditched the case so quickly that neither of them performed enough work to bill the House, sources said. In an odd silver lining for House Republicans, nearly three months after they signed off on the lawsuit, not a single dollar of taxpayer money has been spent. It's also not a given that the legal proceedings, whenever they begin, will drag out beyond Obama's presidency. The expectation among staff working on the case is that a federal court, once the lawsuit is filed, could decide fairly quickly on whether it would go forward. There is little precedent for one chamber of Congress suing the president under these circumstances, and Republican staffers acknowledge the case could get thrown out. House leaders have now all but given up on finding a new lawyer who will take the case, and Boehner is instead considering assigning the work to the chamber's in-house counsel, which is a position appointed by the speaker. "The litigation remains on track," Boehner spokesman Kevin Smith said Thursday, "but we are examining the possibility of forgoing outside counsel and handling the litigation directly through the House, rather than through law firms that are susceptible to political pressure from wealthy, Democratic-leaning clients." Another wild card is the likelihood that Obama will issue a broad executive order legalizing undocumented immigrants after the November election, a move that would inflame Republicans and generate calls for more legal action. In other words, the House could vote again in November or December to add immigration to the resolution authorizing a lawsuit over Obamacare. "We are also closely following what the administration does on executive amnesty, and the possible impact that could have on the litigation strategy," Smith said. Democrats, meanwhile, have turned from criticizing Boehner to mocking him. “Speaker Boehner cannot find a single lawyer in the entire country—even at $500 dollars an hour in taxpayer money—to file a lawsuit that is so totally devoid of any legal merit," said Drew Hammill, a spokesman for Minority Leader Nancy Pelosi. Burck did not return requests for comment. His firm's withdrawal was first reported by Politico on Wednesday night.